Ioannis Koligliatis has a long history in the broadcasting industry and he knows all about the news gathering business, having worked as a cameraman for Reuters, BBC, CNN, ABC and all the major networks globally, as well as all the Greek Television networks. During his career , he won awards and had some hairy moments such as being detained by Serbian forces during the Bosnia conflict. 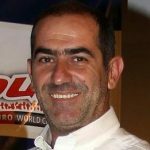 In 1989, Ioannis Koligliatis – General Manager and Owner of INA TV companies established INA TV Productions in Greece, a privately-owned company specializing in crewing and editing, production equipment and personnel hire for domestic and foreign TV channels. In 1996, Ioannis Koligliatis was the cameraman who exclusively filmed, for Associated Press, the Turkish security forces, in the Turkish-occupied north territory of Cyprus, as they opened fire on Greek Cypriot protesters, killing one demonstrator, as he attempted to climb a flag-pole at the border and two United Nations peacekeepers were wounded. For his actions that day, he was honored, the same year at the annual award presentation event of the Athanassios V. Botsis Institution for the Promotion of Journalism. In 2000, INA TV was established as a corporation in U.K. with branch offices in Cyprus. Being the first private uplink provider in Greece, Cyprus and the Balkans is now an internationally recognizable source for production, fast delivery of content, quality service and experienced personnel. In 2012 INA TV was established in Belgium with registered offices in Brussels, for events coverage in Europe in cooperation with the previously mentioned INA TV companies. Thanks to its rapid response to global event coverage, INA TV is now one of the leading independent full-service companies in the broadcast business. INA TV offers services on a 24/7 basis and specializes in new satellite services, production and broadcast solutions for all kinds of events, including news/breaking news, sports, business and entertainment, special events and corporate TV conferences. INA TV can easily meet client’s events requirements in the greater Balkan region, Southern/Western Europe and even more distant locations upon request. With over 25 years of experience and by covering some of the most prestigious sports and news events around the world for major international broadcasters, INA TV has become a prominent production company and broadcast specialist in Europe and the Middle East and offers its services with the highest possible standard of television coverage. INA TV’s strategy and dedication to every client’s success, easily transforms a business idea from a mere concept to an action plan. With creative and effective use of the best tools and state of the art technologies, the company’s staff and network of talented and experienced professionals is committed to deliver your project at the highest available quality, on time and on budget. INA TV covers approximately 1500 events annually by producing independent, advanced and reliable services for event organizers, rights and non-rights holders and has been present for event coverage in over 30 countries worldwide. INA TV has a broad customer base and is the natural choice for a successful collaboration to many foreign and domestic TV stations, leading suppliers of production and broadcast solutions, major satellite operators, governmental and non-governmental organizations, private corporations and news & sports agencies.